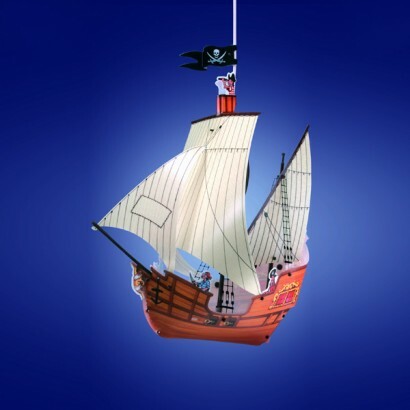 Arrrrrr me hearties, this decorative Pirate Ship Pendant Light Shade is ideal for making bedrooms or play rooms a little bit more fun. Each large lamp shade is made out of tough, lightweight plastic sheets that come part assembled to save you time, just position the front sail and mainsail and your ship light shade is assembled. Of course, to ensure that you have the right kind of ceiling rose to support this large ship lampshade, a ceiling rose is included with plenty of cable to suit very tall rooms, or you can trim it down to keep the ship high in the sky. Brilliant buy! Exactly what I needed to finish my son's bedroom. Very pleased. Well recommended. Have decorated my son's bedroom as a pirate bedroom has a pirate ship painted on his wall and thought this light would be perfect. Came extremely quickly- the next day, my dad did chop off some of the cable, but it is amazing. My little boy absolutely loves it, well worth the cash!!! The Lamp looks great but you may want to shorten the cable a little as it will hang very low from the ceiling. Very basic electrical skills needed to fit. Product delivered quickly and my little boy loved it.